I went last day of Dec in 2012. What's cold when you have hotspring and a hair dryer. U will literally purge whatever 寒 in you. But remember to wipe dry after that. Not supposed to wash with soap after soaking. Might be bad for you. Soap up only before you dip, not after the hotspring. You do not know what you are missing out on. Now aday weather funny but dec will be cold for sure i just came back not cold at all if not raining same as sg but abit dry. Dec go Wulai cold anot ? Which one is a nice one ? Dont taxi super ex!!! Take HSE 南上北下 High speed train or 台铁 Railyway is faster & safer then taxi plus alot cheaper. Left side HSR right side TRA. So far don't have yet, still read up some blogs and get more idea, more like following the below route. Is the below route sounds feasible? Prefer to stay at 名宿 and 温泉酒店。Place to visit: scenery place, sea side, mountains area. Any recommendations? what time I start go back to Ximending? For those staying more than 2 weeks at different places, for the accommodation best to booked before go right? 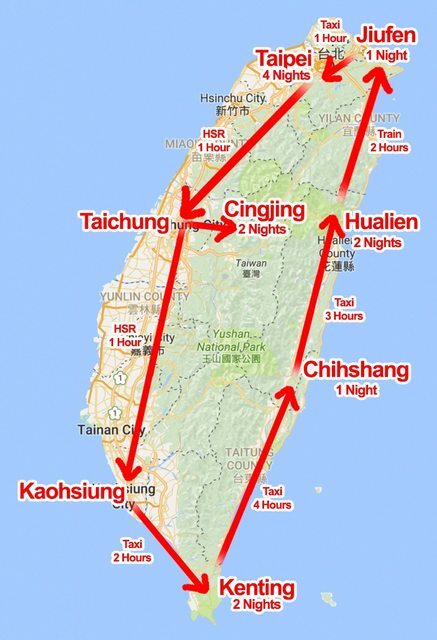 Coz might only stay 2 or 3 nights at a certain place..
Hi, I'm planning to head to Shifen/Pingxi/Jingtong from Taipei. Would taking the TRA from TMS to Ruifang or bus 1062 from Zhongxiao Fuxing Station to Ruifang be more worthwhile in terms of duration of journey and fare? Take bus if you're going to jiufen first. If not going to jiufen, take train better. Well buses run till late. So best to check the blue hour. Lastly, keep warm and dry. Keelung always rain at ruifang. YOU can dun book, as long as you got confident In getting a room, and not over holiday period.